Take the feather football and enter the basic stance. Lift the ball at the same level as your head and let the ball drop. Kick the ball with your knee. And with the other, and the other. Try to keep the ball in the air with only your knees. Repeat until your comfortable with the kick. Take the feather football and enter the basic stance. Lift the ball at the same level as your head and let the ball drop. Kick the ball with the outside of foot. Try to keep the ball in the air with only the outer part of your foot. Repeat until your comfortable with the kick. Take the feather football and enter the basic stance. Lift the ball at the same level as your head and let the ball drop. Kick the ball with the inside of foot. Try to keep the ball in the air with only the inner part of your foot. Repeat until your comfortable with the kick. Take the feather football and enter the basic stance. Lift the ball at the same level as your head and let the ball drop. 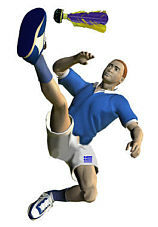 Kick the ball with the instep of foot. Try to keep the ball in the air with only the instep of your foot. Repeat until your comfortable with the kick. Stand in the ready position. Move your kicking leg into front. When the pass comes, jump with your rear leg and then with the front leg. Your legs do a ‘scissor’ movement, with also gives the kick its nickname, the scissors. When airborne, keep your kicking leg in a packet, i.e. don’t let it just fly up. 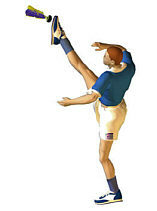 When the ball is just above you, straighten the kicking leg, but do not use too much force. The motion is that of a whip. The ball is supposed to fly fast over your head and the net. Head pass is similar to that of soccer. If you know how to do that, then you know how to do it with a feather football. When you do a head pass, the strength comes from your whole body. Neck, waist, hip and movement need all to be phased correctly for this technique to work with full power. Concentrate most on the sharpness of the head pass and you’ll get results. This kick is a front kick. You raise your foot as high as possible, and the kick is executed when you bring the foot down. At the moment of impact, straighten you ankle to give more power to the kick. This kick is a very dangerous one for the opponent, since it is easy to place the ball anywhere from the most upper court to the most bottom court with this kick. Beware the net. This technique is one from the most known. 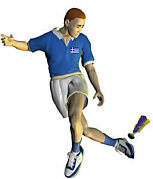 You can stop or control the Shuttlecock with the chest and afterwards you throw it in your teammate or you throw it to your leg, where you finish also your effort kick it to the opponent field. Attention, it needs concentration and big experience. This technique is many times salvation. It is executed with leap and proposing your shoulder to the opponent. It is effective in all possible kicks of your opponents. Also it is ideal for passing to your teammates. Previous Post Razor Drifter – Should You Buy A Razor Drifter?